YorkWriters: February - Short, Sweet, and BUSY! February - Short, Sweet, and BUSY! Somehow, the shortest month of the year has turned out to be one of the busiest release months we've had in a while. As Steve posted at the end of January, we had a lot of stuff coming up, and now it's all out there for you to enjoy. 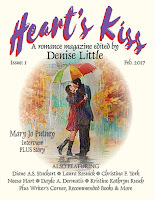 First release was HEART'S KISS, the new romance magazine from Arc Manor, edited by the truly amazing Denise Little. 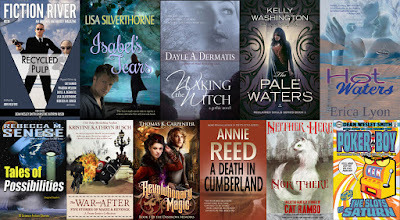 Denise knows romance publishing from every angle, and we are delighted to see her return to editing, where she rocks! She's included some of the best in romance for this premier issue. It's seriously Kermit-flail level of excitement when I think about the stellar company I'm in. If you like romance and great story-telling check out this new magazine at the Heart's Kiss website! The next new release was the Escapist Bundle. Another group of fantastic writers. The opportunity to help SMART, a children's literacy charity here in Oregon. And. last but not least, the chance to finally claim one of my long-hidden pen names. This bundle contains Fiction River Volume 15: Recycled Pulp, which has my story "Swamp of the Prehistoric Clan." I'll come back to that story in a minute. There is also my full-length novel HOT WATERS. It was one of my first books, and I am still quite pleased with it. However, it was pretty racy at the time I wrote it - the romance field has changed some in the years since - and there were members of my family who would have been quite upset by some of the content. 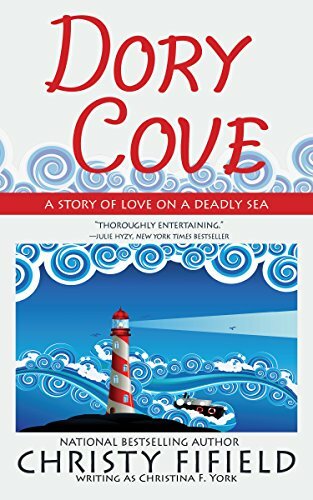 For that reason, and to separate it from the young adult work I was doing, the book was released under the name Erica Lyon. Those family members are now gone, and I can publicly claim HOT WATERS without fear of upsetting their sensibilities. Unfortunately, the publisher closed before Erica's second book was released, and HOT WATERS saw very limited release. Now it has a new, more contemporary cover, and I've included the sequel short story in the version done for this bundle. That short story was in a volume of short stories that never got distributed, so it's a bonus only available in this bundle. I will release the new edition after the bundle ends, but for now this is the only place you can read the sequel. "But what about 'Swamp of the Prehistoric Clan?'" you ask. Well, there's a story behind that one, too. When I wrote the story for Fiction River, the editor was gave us the challenge of using a pulp title to write a story that was anything but a pulp story. The resulting volume has some truly inventive takes on what a given title might represent. Being me, I managed to take the title he gave me and turn it into a cozy mystery set in a troubled retirement community in the late 1970s. Claire and Violet are two women who appear to have very little in common, besides being neighbors in the under-construction development north of San Diego. But everyone has secrets, and the secrets these two carry go all the way back to World War II. Then little more than teenagers, both women were part of the clandestine services-a history that's been a closely-guarded secret for forty years. 'Swamp of the Prehistoric Clan' is the story of how these two meet and join forces. Neither one is ready to give up her secrets just yet, but it's clear these women aren't ready to spend the rest of their lives playing bridge and going to Tupperware parties. Besides 'Swamp' I wrote several short stories that explored the back stories of these two women. One of them, 'Cost and Conscience,' appeared in Fiction River Volume 12: Risk Takers. The other had not been published, so I took the short and sweet month of February to remedy that situation. THE SPY GIRLS FILES contains all five stories, along with individual essays that puts each story into historical context. Read the stories, and if you want a little more background there's an essay to explain how each one fits into our real history. 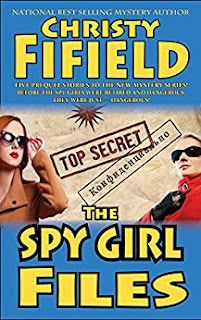 And watch for Spy Girls novels, coming from Tsunami Ridge Publishing later this year! Finally, we re-released the contemporary romance DORY COVE with an updated description, new cover, and a re-designed interior. It's available now as an ebook, and the print version should be along soon! When he's injured, Davey still can't break his own rules, especially #1. Even for the woman he loves. But what happens when your heart overrules your head? Sometimes you have to break all the rules. Even rule #1. So that's our busy February! We hope you'll find something to love in this month's releases. These test results show that the X-Cel Modular system is ideal for segmental, suspension and long-span bridges. The system is also recommended for use on offshore structures and for flexible structures that require a high level of durability. Interesting reviews. My reading recommendations for you would be more like reviews on Ninja essay or something like that :) So I totally appreciate you posting this list here, thanks a lot!